A Feature by Mary Couzens for EXTRA! EXTRA! This year marks the centenary of the first time Georgia O’Keeffe’s art was ever exhibited, at Gallery 291 in New York City, and Tate Modern has, in tribute, mounted the first exhibition of the artist’s work in the UK for twenty years, and the largest ever staged in this country. Whether you are already an enthusiast of O’Keeffe’s art or a relative newcomer, there are ample reasons to take this once in a lifetime opportunity to access and appreciate her work. Georgia O’Keeffe (1887-1986) was an artist who, through her unique vision and creativity elevated everyday, oft rough, sometimes jarring objects and landscapes into smooth, at times, almost soothing, always evocative remembrances of valued experiences in her life. Best known perhaps, for her over-sized, microscopically close paintings of flowers, desert bones and the arid, cliff-hewn landscapes of her adopted home of New Mexico, the more than meets the eye allure of her paintings is their power to permeate viewers much as their subjects themselves penetrated the consciousness of the artist, who somehow, captured, then, mirrored their essence back at us. The holding power of O’Keeffe’s inadvertently mesmerising art is still, astounding, reminding us that true artistry is always, inborn and though techniques can be refined through training, true artistic vision is a gift, rather than a given. Gallery-goers rarely have the privilege of viewing works by an artist active in the arts for nearly seventy years, and here Tate has chosen to focus on the eras in which O’Keeffe was exhibiting, before age affected her eyesight to the point where new works were no longer on show. From her first exhibition in New York City’s ‘291’ Gallery in 1916, arranged by Photographer Alfred Stieglitz (1864-1946), to become her husband in 1924, through the mid 1960’s, viewers are afforded a panoramic view of the resonating arc of her creative brilliance, when innovative ideas were, seemingly blooming as regularly as the blossoms she would go on to knowingly depict. Born in Wisconsin in 1887, O’Keeffe harboured artist aspirations by age twelve, and her artistic flow first carried her art to New York City in 1916, then she herself later that year to Stieglitz, after which they began a thirty year correspondence, leading to her first solo exhibition at 291 Gallery in 1917, subsequent travel to New York City in 1918, after, resignation from her teaching post in Texas to take Stieglitz up on his offer of a year’s painting which he underwrote. O’ Keeffe’s move, in turn, inspired Stieglitz to finally, leave his ever incompatible wife, move in with her and in 1921, exhibit his multi-faceted photographic portraits of her, some, of an intimate nature, all, innovatively artistic, in the aftermath of which, O’ Keeffe herself became a subject of intense media interest. The resulting publicity lead to a widening of O’Keefe’s artistic options, and, eventually her most prolific period in New Mexico during intermittent summers spent there, buying a house on Ghost Ranch there in 1940, and relocating there in 1949, after Stieglitz’s death in 1946. In Room One of the exhibition, with its concise collection of O’Keeffe early works, Tate aims to recreate the setting of that first exhibition, right down to the sagebrush green walls of Stieglitz’s New York gallery. 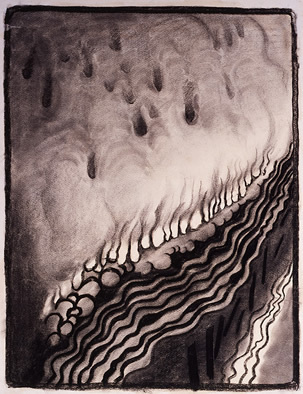 There is something gripping about O’Keeffe’s creative expressions from the outset, early charcoal, experimental abstract drawings slowing, rather than moving viewers along. This is generally not the case with most major exhibitions, where early works are often viewed merely as steps along the path to ultimate creative expression, rather than bona fide works of art in themselves. It quickly dawns that O’Keeffe’s work is best lingered before and, absorbed, as she herself absorbed the vibes of her subjects. So, as we make our way, we often feel inclined to stop, drink in and ponder her art, as the realisation that it’s all about experiences, rather than physical components takes hold. Learning who and what inspired O’Keeffe’s creativity helps broaden our perspective and appreciation, but her unique vision was always her own. ‘Special No. 9’ is as intricate and absorbing an example of emotionally gripping abstraction you’re ever likely to see, surprisingly so, as it happens, and viewers will readily empathise with Stieglitz’s inwardly informed, more or less instant decision to exhibit this drawing and others by O’Keeffe in 1916, alongside works by other underrated masters of the day like Picasso. ‘Red and Orange Streak’ 1919 a vivid painting among the few in Room 1, in which O’Keeffe recounts memories of a Texas plain, which she described as having ‘land like the ocean’, tied in with her growing interest in synaesthesia and chromesthesia in which sounds evoke specific colours, a topic she’d studied through the writings of Kandinsky’s ‘The Art of Spiritual Harmony’ and Arthur Wesley Dow’s ‘Composition’. Dow’s belief that the essence of composition was to ‘fill a space in a beautiful way’ was one she came to embody. The sound haunting her in this painting was that of cows lowing for their calves…’loud and raw under the stars in that wide, empty country.’ In a photographic sense, in addition to Stieglitz’s poetic realism, O’Keeffe was also influenced by the work of Paul Strand (1890 – 1976), whose ‘flattened still life’s of everyday objects’ inspired her way of seeing, and Ansel Adams, who became a life-long friend. Interestingly, both O’Keeffe and Adams were accomplished musicians who chose art instead. With a multitude of O’Keeffe’s enveloping canvases to immerse myself in, I entered a room of New York paintings, happily surrendering to them, as I metaphorically walked along O’Keeffe’s creative path. The renowned artist may have been pleased with that notion, as she herself re-lived her daily ambles in surrounding landscapes through her canvases, letting her brush recount what inwardly remained of them. 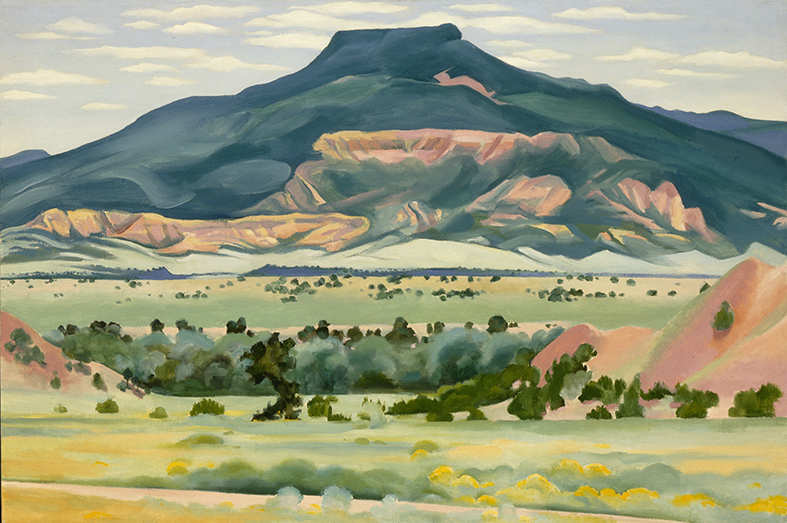 Whether New Mexico, or, Manhattan, landscapes and their features always figured prominently, from larger than life interpretations of smooth desert bones and rugged, mountain horizons to the urban glow of streetlamps and looming skyscrapers. The New York paintings are just one collection of works that mirrored the experimental photography of the day, particularly Stieglitz’s, in this case, his atmospheric, now iconic NYC black and whites. 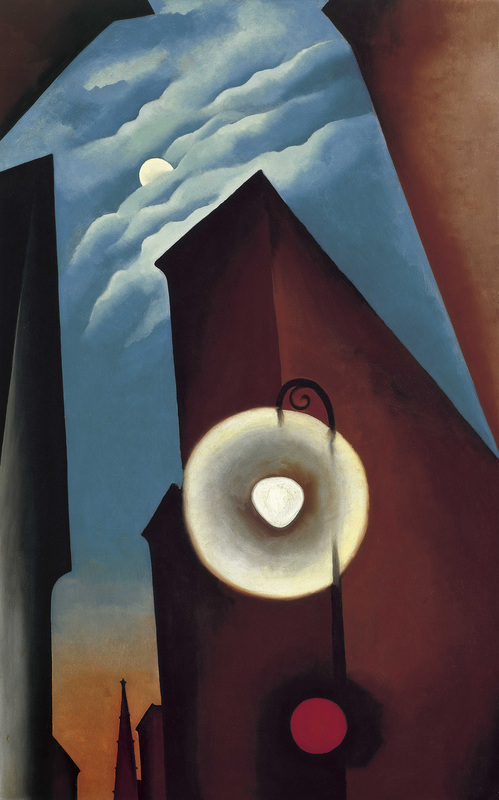 Bathing beneath a street lamp’s tawdry glow in ‘New York Street with Moon’ 1925, O’Keeffe’s first ever New York painting, on relocating there from Texas in 1918, one taps into distant afterglows of New York moons enjoyed, long after. Georgia O’Keeffe 1887-1986 New York Street with Moon 1925 Oil paint on canvas 1220 x 770 mm Carmen Thyssen-Bornemisza Collection on loan at the Museo Thyssen-Bornemisza, Madrid © 2016 Georgia O'Keeffe Museum/ DACS, London. In contrast, Lake George Room displays evocative, oft abstract renderings such as ‘Farmhouse Door and Window’ 1929 and somewhat more figurative paintings of autumn leaves, maple trees, the lake, stormy clouds, barns as well as still life’s of fruit and leaves in a wide pallet of colours. Taking in a smaller room devoted to Flowers and Still Life’s immediately after may further expand the range of O’Keeffe’s artistic expression in minds of viewers. 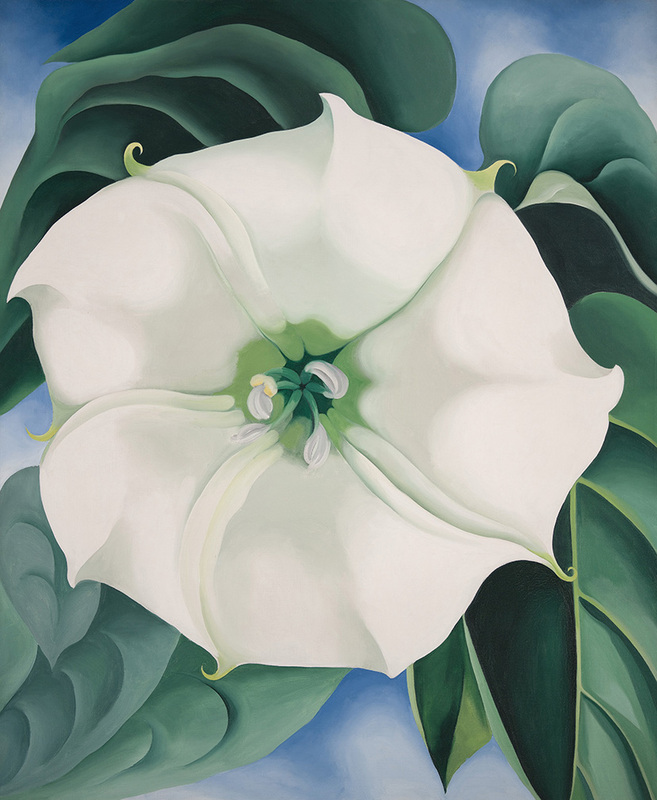 Among offerings here is the exquisite, ‘Jimson Weed/White Flower No 1, 1932,’ the most expensive painting created by a female artist, which sold last year for $44.4 m. This luminous work is a fine example of O’Keeffe’s ability to lovingly elevate everyday subjects to near legendary, iconic status. Among the many highlights of Room 7, entitled New Mexico, Taos and ‘Alcalde, two paintings, each stunning in their own way, capture the imagination: ‘Black Cross with Stars and Blue,’ 1929 and ‘Ranchos Church, New Mexico’, 1930-1. 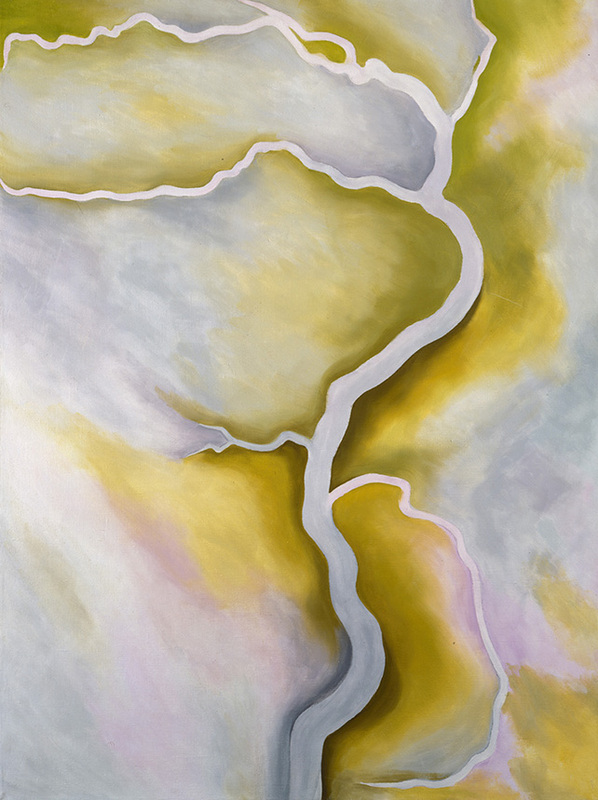 Both have the power to evocatively expand viewers understandings of them beyond commonplace awareness of their subject matter, thanks to O’Keeffe’s deeply focused and connected artistic gaze. The former, shows only a rather plain portion of a church, rather than its’ more traditional subject of a façade, the latter work with its’ Catholic cross planted on Naïve American land, juxtaposed against the outline of Taos Mountain represents the many layers of culture akin to the American landscape. 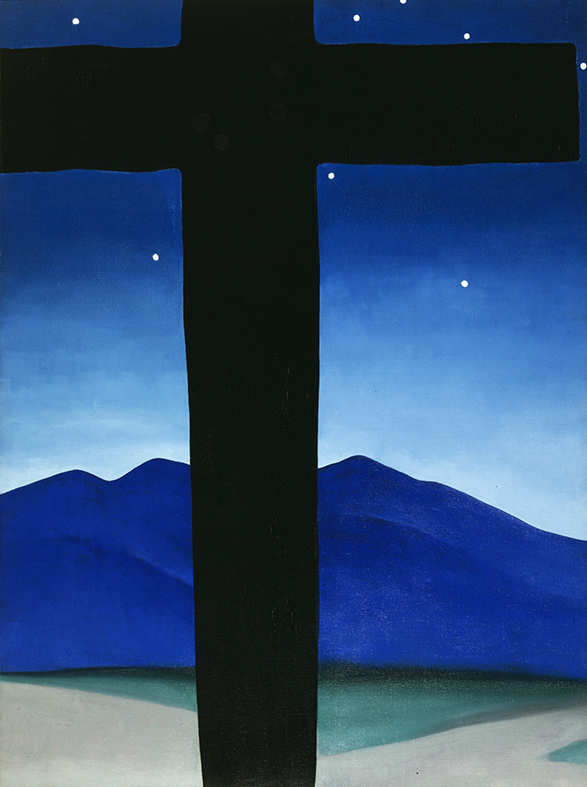 Georgia O’Keeffe 1887-1986 Black Cross with Stars and Blue 1929 Oil paint on canvas 1016 x 762 mm Private collection © 2016 Georgia O'Keeffe Museum/ DACS, London. 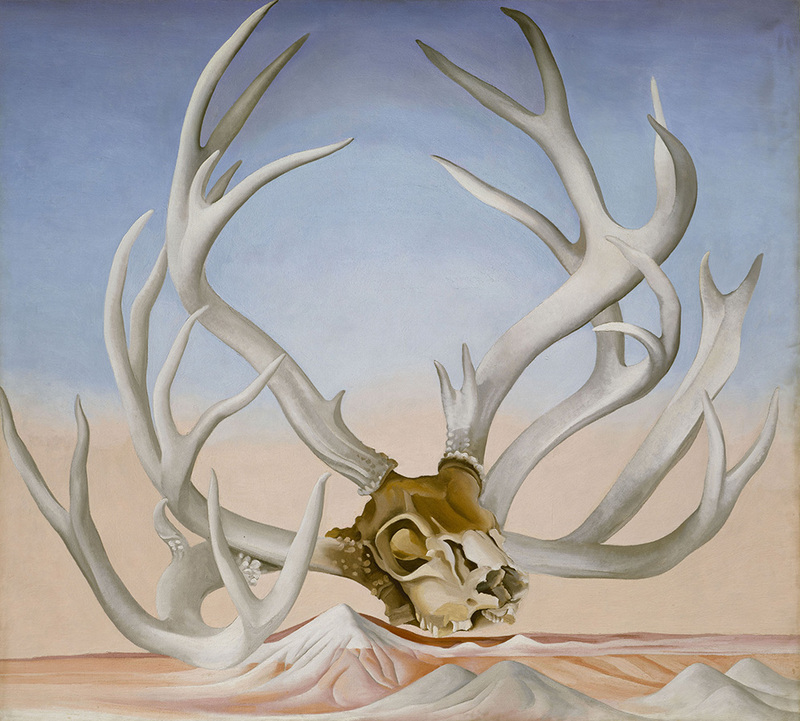 In terms of iconic imagery, few paintings, if any could top O’Keeffe’s, of desert bones, one of the most famed among them being, ‘From the Faraway, Nearby’ 1937, a large, softly amplified rendering of steers’ skulls, antlers fanned out flower-like, against sky blue above, and pink moving into white mountains, as the bones hover above, like the spirit of the land. What O’Keeffe may have been citing in the rather oblique title of the work could be the distance between ‘then’ and now, as in, the life of the animal and the present of the living observer, assessing its’ remains. Interpretations of the work as a form of surrealism troubled O’Keeffe who said in response that, in contrast that they (the bones) were ‘a new way of trying to define my feeling about that country…they seem to think that painting bones is news…It makes me feel like crawling far far into a dark hole and staying there a long long time. Ghost Ranch, first seen by O’Keeffe in 1934, when it was still a ‘Dude Ranch’ providing an experience of the ‘Wild West’ for wealthy visitors was initially, a place that, in theory, she wanted nothing to do with, though she stayed in an adobe house on the property from 1937. The house, Rancho de los Burros, became her first home in New Mexico in 1940, when she bought it, and Cerro Perdenal or Flint Hill, visible from her front window, appeared many times in, one form or another in her paintings thereafter. Although the pallet of Impressionist Paul Cezanne, whose work O’ Keeffe admired, may seem in evidence in ‘My Front Yard, Summer 1941, the colourings are all O’Keeffe’s as they appeared to her on the mountain and surrounds. 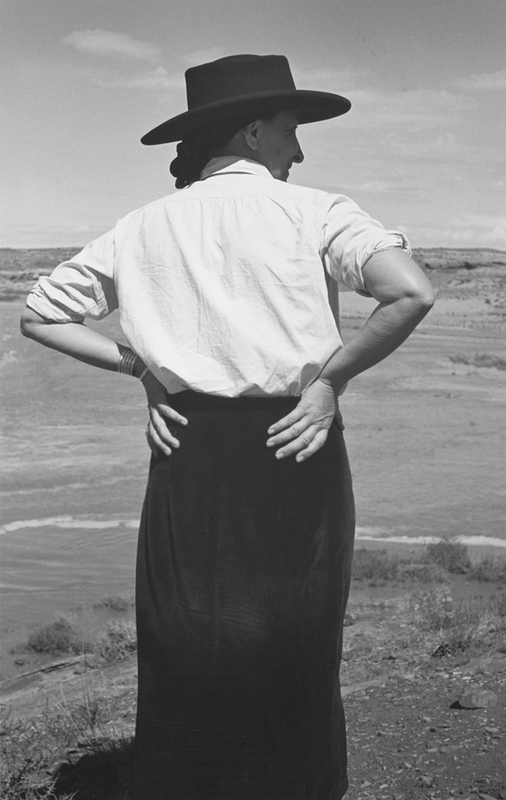 Throughout her career, O’Keeffe kept her eye on what was going on the art world, noting new trends, despite the remoteness of her locale in later years. 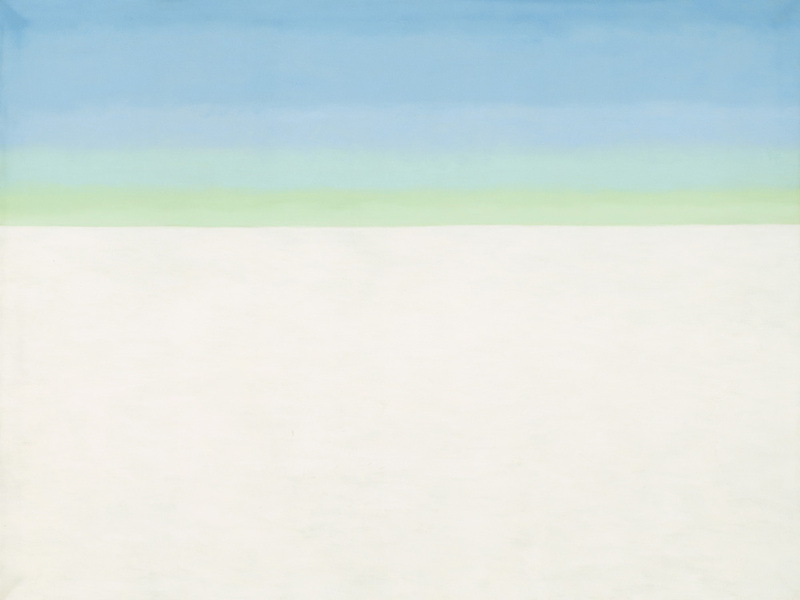 She may have been ‘the loner in the desert’, but she was still, full of ideas and innovations, as this more abstracted view of Perdernal, in pastels utilizing a limited, no less expressive colour range demonstrates. 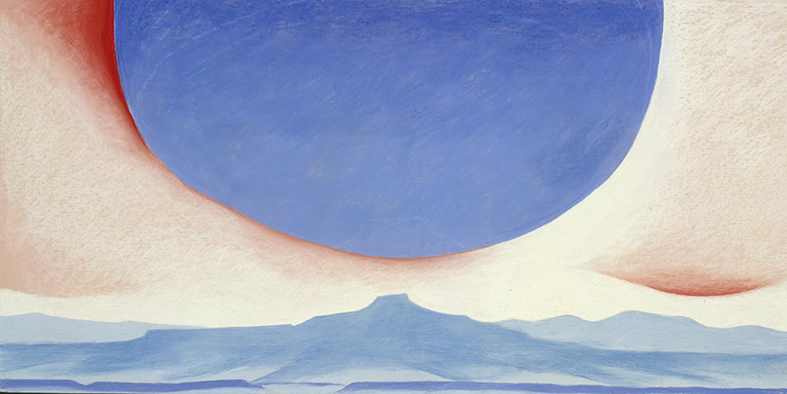 O’Keeffe used only what was needed, no more, to express what she wished to convey. As her work progressed, over the years, capturing the essence of nature became more and more dependent upon colour and how it could be used to express emotion. In the 1950’s and ‘60’s, O’Keeffe began to travel the world and the views from airplanes, which she found amazing, inspired her to become even more experimental in terms of abstraction. In 1971, O’Keeffe lost her central vision, retaining only peripheral eyesight, yet her artistic inner vision never dimmed and she completed her last unassisted oil painting the following year. Sculptor/potter Juan Hamilton, whom she met in 1973, became friend, travelling companion and assistant, helping her with her final projects, even enabling compilations of her work to be put into print. The singular way in which O'Keeffe managed to imbue her subjects, or, rather, as she herself put it, her experiences of them with such potent sense of place and presence is surely, one of the great mysteries of modernist art, and through this comprehensive exhibition, one well worth contemplating.